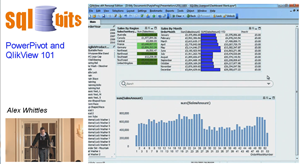 The video is now available from my PowerPivot and QlikView talk at SQLBits 9 in Liverpool in September 2011. You can download or watch the video here. In this 1 hour session I create interactive dashboards from scratch in both PowerPivot and QlikView, showing how to set up the data model, overcome common pitfalls and build the dashboards. I create almost identical dashboards in both systems and highllight the pros and cons of each system. Today the SQLBits organisers have announced that SQLBits 10 will be held in London between 29th – 31st March 2012 in the Novotel London West. It’s going to be even bigger and better, so keep an eye on the website and get your tickets early.